*If you don’t have the desktop version of Skype for Business, or don’t have a Skype for Business account, you can use Skype Meetings App or Skype for Business Web App to join a Skype for Business meeting from your browser. 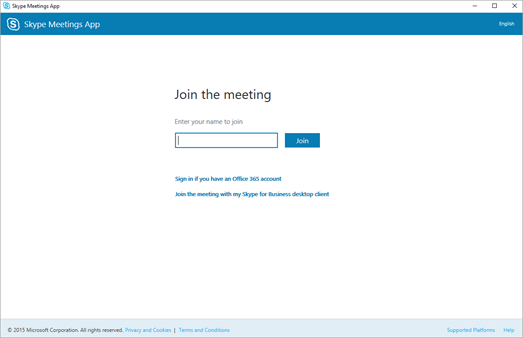 Here are the basic steps to join a Skype for Business meeting with Skype for Business Web App. Open the meeting request in your email or calendar, and select Join Skype Meeting. 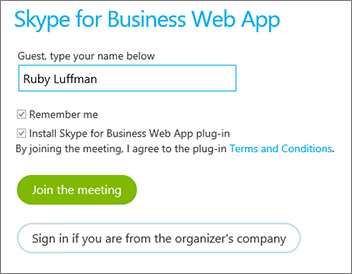 On the Skype for Business Web App sign-in page, enter your name, and select Join the meeting. If you're in the lobby, the meeting organizer and other presenters are immediately notified that you're waiting. Here are the basic steps to join a Skype for Business meeting with Skype Meetings App. On the Skype Meetings App sign-in page, enter your name, and select Join. Follow your browser's instructions for installing Skype Meetings App. For example, in Internet Explorer, select Run when you see the alert at the bottom of the browser window.